Ashgabat (Turkmen: Aşgabat, [aʃʁaˈbat]; Russian: Ашхаба́д, Ashkhabad; [ɐʂxɐˈbat]) — was named as Poltoratsk (Russian: Полтора́цк; [pəltɐˈrat͡sk]) between 1919 and 1927, is the capital and the largest city of Turkmenistan in Central Asia, situated between the Karakum Desert and the Kopet Dag mountain range. Ashgabat is called Aşgabat in Turkmen, Ашхабад (Ashkhabad) in Russian, and Ešq-ābād (عشق‌آباد) in Persian. Before 1991, the city was usually spelled Ashkhabad in English, a transliteration of the Russian form. It has also been variously spelled Ashkhabat and Ashgabad. From 1919 until 1927 the city was renamed Poltoratsk after a local revolution. The name means "city of love" or "city of devotion". Some Turkmen scholars insist that the name goes back to the Parthian era, 3rd century BC, deriving from the name of the founder of the Parthian Empire, Arsaces I of Parthia, in Persian Ashk-Abad (the city of Ashk/Arsaces). Ashgabat is a relatively young city, having been founded in 1881 as a fortification and named after the nearby settlement of Askhabad (lit. beloved city in Turkmen). Located not far from the site of Nisa, the ancient capital of the Parthian Empire, it grew on the ruins of the Silk Road city of Konjikala, first mentioned as a wine-producing village in the 2nd century BC and leveled by an earthquake in the 1st century BC (a precursor of the 1948 Ashgabat earthquake). Konjikala was rebuilt because of its advantageous location on the Silk Road and it flourished until its destruction by Mongols in the 13th century. After that it survived as a small village until Russians took over in the 19th century. A part of Persia until the Battle of Geok Tepe, Askhabad was ceded to the Russian Empire under the terms of the Akhal Treaty. Russia developed the area as it was close to the border of British-influenced Persia. It was regarded as a pleasant town with European style buildings, shops, and hotels. In 1908, the first Bahá'í House of Worship was built in Askhabat. It was badly damaged in the 1948 earthquake and finally demolished in 1963. The community of the Bahá'í Faith in Turkmenistan was largely based in Ashgabat. Soviet rule was established in Ashgabat in December 1917. However, in July 1918, a coalition of Mensheviks, Social Revolutionaries, and Tsarist former officers of the Imperial Russian Army revolted against the Bolshevik rule emanating from Tashkent and established the Ashkhabad Executive Committee. After receiving some support (but even more promises) from General Malleson, the British withdrew in April 1919 and the Tashkent Soviet resumed control of the city. In 1919, the city was renamed Poltoratsk (Полторацк), after Pavel Poltoratsky, the Chairman of the Soviet of National Economy of the Turkestan Autonomous Soviet Socialist Republic. When the Turkmen SSR was established in 1924, Poltoratsk became its capital. The original name (in the form of "Ashkhabad") was restored in 1927. From this period onward, the city experienced rapid growth and industrialisation, although severely disrupted by a major earthquake on October 6, 1948. An estimated 7.3 on the Richter scale, the earthquake killed 110-176,000 (⅔ of the population of the city), although the official number announced by Soviet news was only 40,000. In July 2003, all the names of streets in Ashgabat were replaced by serial numbers except nine major highways, some named after Saparmurat Niyazov, his father and mother. The Central Palace area is designated 2000 to symbolize the beginning of the 21st century. The rest of the streets have larger or smaller four-digit numerical names. In 2013, the city was included in the Guinness Book of Records as the world's highest concentration of white marble buildings. According to estimates of the 2012 Turkmen census the Turkmen form 85% of the city's population. Russians form 7.7% of the population, followed by Armenians (1.5%), Turks (1.1%), Uzbeks (1.1%), and Azeris (1%). When Ashgabat was under Russian rule, the number of Bahá'ís in the city rose to over 1,000, and a Bahá'í community was established, with its own schools, medical facilities and cemetery. The community elected one of the first Bahá'í local administrative institutions. In 1908 the Bahá'í community completed the construction of the first Bahá'í House of Worship, sometimes referred to by its Arabic name of mašriqu-l-'aḏkār (Arabic: مشرق اﻻذكار‎‎), where people of all religions may worship God without denominational restrictions. The building was designed under the guidance of `Abdu'l-Bahá by Ustad' Ali-Akbar Banna Yazdi who also wrote a history of the Baha'is in Ashgabat. The House of Worship itself was surrounded by gardens, with four buildings at the four corners of the gardens: a school, a hostel where travelling Bahá'ís were entertained, a small hospital, and a building for groundskeepers. Under the Soviet policy towards religion, the Bahá'ís, strictly adhering to their principle of obedience to legal government, abandoned these properties in 1928. For the decade from 1938 to 1948, when it was seriously damaged by the earthquake, it was an art gallery. It was demolished in 1963. After exiting the Soviet Union, the city gained many high-rise residential buildings. Modern construction techniques allow high-rise development (mainly 12 storeys) with relatively good protection against earthquakes. Primarily consisting of residential towers, the first floor is typically given a shopping area and a service department. Many of the buildings are made of white marble. The Arch of Neutrality was dismantled and re-erected in its original form in the south of the capital. Turkmenistan Tower, at a height of 211 meters, is the tallest building in the country. The principal industries are cotton textiles and metal working. It is a major stop on the Trans-Caspian railway. A large percentage of the employment in Ashgabat is provided by the state institutions; such as the ministries, undersecretariats, and other administrative bodies of the Turkmenistan government. There are also many foreign citizens working as diplomats or clerks in the embassies of their respective countries. Ashgabat lends its name to the Ashgabat agreement, signed by India, Oman, Iran, Turkmenistan, Uzbekistan and Kazakhstan, for creating an international transport and transit corridor facilitating transportation of goods between Central Asia and the Persian Gulf. More than 43 large and 128 medium-sized industrial enterprises along with over 1,700 small industrial facilities are located in Ashgabat and its suburbs. The most important are “Ashneftemash”, “Turkmenkabel”, “Turkmenbashi Textile Complex” etc. Both locals and visitors go to Altyn Asyr Bazaar in Choganly, where many items, including traditional fabrics and hand-woven carpets, can be bought. Modern shopping areas are mostly found in central streets, including the modern Turkish mall Ýimpaş and shopping centers Paýtagt and Aşgabat. The local residents like traditional bazaars: Russian bazaar, Teke bazaar, Daşoguz bazaar, Mir bazaar, Jennet bazaar, etc. Yimpas closed as of December 2016. The city is served by the Ashgabat International Airport. Turkmenistan Airlines has its headquarters in the city. Ashgabat offers air service to and from all the major cities of the Turkmenistan, as well as some destinations in Asia and Europe, especially in countries that are members of the CIS. Ashgabat is served by the following foreign airlines: Belavia, Lufthansa, Turkish Airlines, S7 Airlines, flydubai, China Southern Airlines and Uzbekistan Airways. The Trans-Caspian Railway (Turkmenbashi - Balkanabat - Bereket - Ashgabat - Mary - Türkmenabat) runs through Ashgabat from east to west. Since 2006 there as also been a train line towards the north, the Trans Karakum railway. In May 2009 the restoration of Ashgabat railway station was completed. In Ashgabat there are two intercity bus stations, one located near the Teke Bazaar, the second at the old airport. There are daily buses to Archman, Dashoguz and Turkmenabat. The new International Passenger Bus Terminal of Ashgabat was commissioned on September 5, 2014. Public transport in the city consists mainly of buses. More than 60 bus lines cover a total range of more than 2,230 kilometres (1,386 miles) with 700 buses running on urban routes. Currently the city primarily uses Mercedes-Benz and Hyunda buses. Bus timetables and detailed schematic map of the route are at every stop. Distances between stops are about 300–500 meters. From October 19, 1964 to December 31, 2011 the city also had the Ashgabat trolleybus system. At the beginning of the twentieth century narrow-gauge railway operated by steam-power, connecting the city with the suburbs Firyuza. On 18 October 2006, the Ashgabat Cable Car opened, connecting the city with the foothills of the Kopetdag. Ashgabat Monorail commenced service in 2016, becoming the first monorail in the Central Asia region. Ashgabat is the most important educational center of Turkmenistan with a large number of places of education. Turkmen State University was founded in 1950: the main university building is located in Saparmurat Turkmenbashi Avenue. The Turkmen State Medical University is situated in Ashgabat also: it reports to the Ministry of Health and the medical industry of Turkmenistan. Other prominent institutions are the Turkmen State Institute of Economics and Management, a main business school founded in 1980, as well as the Turkmen State Institute of Architecture and Construction and The National Institute of Sports and Tourism of Turkmenistan. There is only one foreign university - International Turkmen-Turkish University. In 2016, Technology University of Oguzhan was opened with Japanese education support and subjects are taught in English and Japanese. The Kopet-Dag mountain range is about 25 kilometres (16 mi) to the south, and Ashgabat's northern boundary touches the Kara-Kum desert. Because of this Ashgabat has an arid climate with hot, dry summers and cool, short winters. The average high temperature in July is 38.3 °C (100.9 °F). Nighttimes in the summer are warm, with an average minimum temperature in July of 23.8 °C (75 °F). The average January high temperature is 8.6 °C (47.5 °F), and the average low temperature is −0.4 °C (31.3 °F). The highest temperature ever recorded in Ashgabat is 47.2 °C (117 °F), recorded in June 2015. A low temperature of −24.1 °C (−11 °F) was recorded in January 1969. Snow is infrequent in the area. Annual precipitation is only 201 millimetres (7.91 in); March and April are the wettest months, and summer drought, from late June to September, is virtually absolute. Museums include the Turkmen Fine Arts Museum and Turkmen Carpet Museum, noted for their impressive collection of woven carpets as well as a Turkmen history museum and the Ashgabat National Museum of History, which displays artifacts dating back to the Parthian and Persian civilizations. The Academy of Sciences of Turkmenistan is an important institute of higher learning. Ashgabat was also home to the Arch of Neutrality, a 250-foot-tall tripod crowned by a golden statue of late president Saparmurat Niyazov (also known as Turkmenbashi, or leader of all Turkmen). The 50-foot-high statue, which rotated in order to always face the sun during daylight hours, was removed on August 26, 2010 after Niyazov’s successor, current President Gurbanguly Berdimuhamedov, made it clear earlier in the year that the statue was going to be taken out of Ashgabat’s parliament square. In 2011 a Monument to the Constitution was built, the total height - 185 meters, makes it the second tallest building in Turkmenistan. Alem Cultural and Entertainment Center was recognised by Guinness World Records as the world's tallest Ferris wheel in an enclosed space. The Ashgabat Flagpole is the fourth tallest free-standing flagpole in the world, standing at 133 m (436 ft) tall. The Ashgabat Fountain is the world's greatest number of fountain pools in a public place. Ashgabat also features Turkmenistan Tower which is the tallest tower in Turkmenistan, the decorative octagonal Star of Oguzkhan is recognized as the world's largest architectural image of the star and entered in the Guinness World Records. 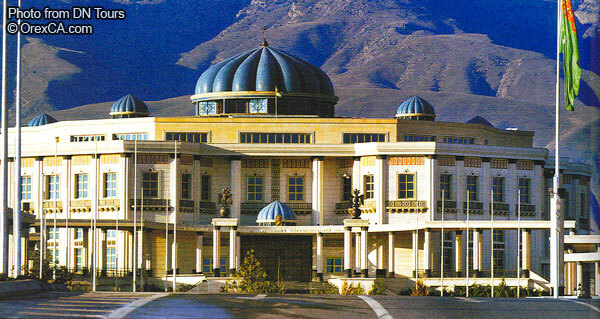 Rukhiyet Palace, place for official state events, forums, meetings, meetings, meetings, inaugurations. Ashgabat has many parks and open spaces mainly established in the early years of the Independence and well maintained and expanded thereafter. The most important of these parks are: the Botanical Garden, Güneş, Turkmen-Turkish friendship, Independence. The oldest city park - Ashgabat, was founded in 1887. In the center of Ashgabat is the Inspiration Alley, an art-park complex which is a favorite place for many locals. The amusement park World of Turkmenbashi Tales is a local equivalent to Disneyland. Squares: 10 Years of Turkmenistan Independence, Magtymguly, Eternal Flame, Zelili, Chyrchyk, Garashsyzlyk, March 8, Gerogly, Dolphin, 15 years of Independence, Ruhyýet, 10 ýyl Abadançylyk. 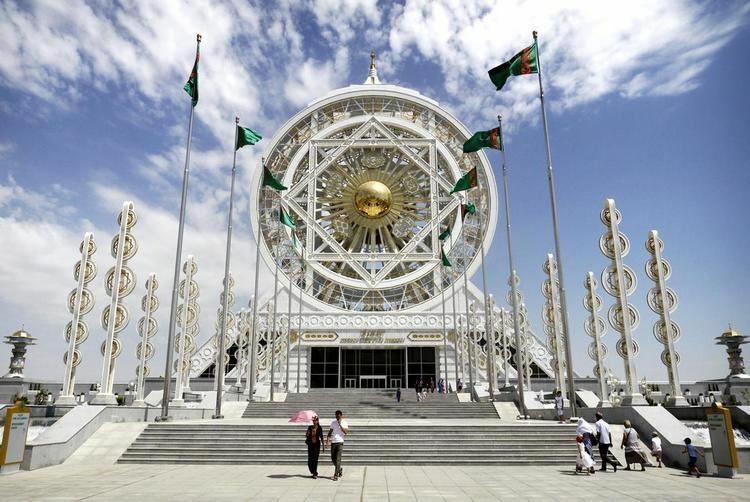 Halk Hakydasy Memorial Complex was opened in 2014 in remembrance of those killed in Battle of Geok Tepe, World War II and to commemorate of the victims of the 1948 Ashgabat earthquake. It is located in south-western part of the city. Ärtogrul Gazy Mosque, a gift from Turkey, was inaugurated in 1998. This magnificent building resembles the Blue Mosque in Istanbul. The city's professional football clubs Altyn Asyr, FC Ashgabat, HTTU Aşgabat and FC Hazyna play in the Ýokary Liga, the top flight of Turkmenistan.